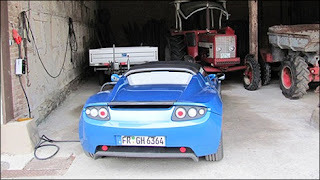 Hansjorg von Gemmingen has driven more than 65,000 kilometers (40,000 miles) in his Tesla Roadster in one year, earning him distinction as one of the highest mileage Tesla owners in Europe. The stock broker drives his Electric Blue car almost every day, and he charges it nightly with conventional plugs in his garage. In addition to using the Roadster for commuting and errands in his native Freiburg, he and his wife also take the car on weekend road trips. They charge the car at homes, hotels, parking structures and even barns and farm houses. "As soon as I started driving my Tesla Roadster, the petrol in my blood turned electric," von Gemmingen said. "When I was driving a conventional car, I did not look for outlets, so I didn't understand how easy it would be to charge an EV. But now I see outlets everywhere, and I don't have problems charging at home or on the road." Von Gemmingen discovered Tesla in 2008 when the Silicon Valley startup was featured in a German business magazine. He took a test drive during the 2009 Geneva Motor Show and in October 2009 became one of the first people in Germany to take delivery of a Roadster. Roadsters 'Round the World' Tesla has already delivered about 1,300 cars to customers in at least 30 countries - from sweltering Singapore to Alaska, Canada and Russia. Tesla estimates that Roadsters have been driven more than 11 million kilometers - by von Gemmingen and other customers, and by Tesla engineers. Tesla has delivered more than 300 cars to customers throughout Europe. Tesla has customers from Naples, Italy, to Narvik, Norway, about 220 kilometers north of the Arctic Circle. Tesla performed cold-weather testing on a frozen lake in Arvidsjaur, Sweden. The Roadster consumes no gasoline whatsoever and therefore never requires expensive and time-consuming detours to the gas station - a major convenience when temperatures drop. Owners simply plug their Roadster into conventional outlets from the peace and warmth of their homes, and every morning the car is fully charged. It would be interesting to compare the medium cost by mile of this Tesla and of a similar car in a similar situation, with an internal combustion engine, after 40,000 miles/year of normal usage. After the super marathon of 60.000 km of Tesla, now the long journey of 26,000 km of the electric SRZero Imperial College sportcar, from Alaska to Argentina. After all, who still suffer "range anxiety" in electric cars? Major questions to be answered. Now after 65k km, what is the range on a full charge? The Tesla was supposed to get about 360 km on a full charge. What was the range when it was new? Now with how 200-300 charge cycles and 65,000 km, how many km on a full recharge? It is not said, but are the batteries the original batteries that came with the vehicle new? The batteries used in the Tesla are similar or same as used in laptop computers. These batteries last about 1-2 years and recharging is probably around 200-300 times a year. The only difference is the Tesla uses 6,831 of these batteries. So how is your Tesla doing today?